The results sheet of the digital counting of the ballots after voting on December 30. Lusaka — THE Southern African Development Community (SADC) has endorsed the crisis-laden general election in the Democratic Republic of Congo (DRC). Joseph Malanji, Head of the SADC Electoral Observer Mission (SEOM), said the political and security environment before, during and immediately after polling was "generally peaceful." "Our observers generally reported an atmosphere of peace in the areas they observed during their period of deployment," Malanji, who is Zambia Foreign Affairs Minister, said. "Generally the atmosphere was orderly, calm and peaceful at most polling stations," the SADC envoy added. He said while in the rest of the country, campaign events were "mostly peaceful and well attended" there were acts of violence that led to loss of lives in the Kalemie, Lubumbashi and Mbuji-Mayi areas. The SADC mission also noted with concern the burning of one of warehouses of the electoral agency in Kinshasa, which resulted in damage to electoral material during the pre-election phase. It led to the postponement of the elections from December 23 to December 30. "The incidents notwithstanding, the mission notes that the Congolese people rose above these developments and proceeded to vote in peace," Malanji said. In accordance with the revised SADC Principles and Guidelines Governing Democratic Elections (2015), the mission's final report will be issued within 30 days of the conclusion of the election. DRC is one of 16 SADC member states. A member since 1997, it is the most unstable, with a series of conflict since independence from Belgium in 1960. 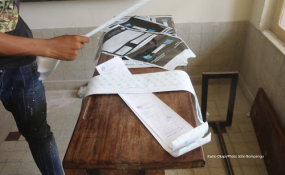 Polls were initially set for 2016 but outgoing president, Joseph Kabila, failed to arrange them.